When I found out I would get the opportunity to review the first ever M3 ever produced, I was giddy with happiness and anxiety. Just to clarify how much of a coup this is, only 4,996 of these were sold in North America during its six year run. BMW’s M (called Motorsport GmbH then) was created in 1975 to aid BMW’s presence in motor racing in the 1960s-1970s. However, they started to add mechanical and cosmetic upgrades to BMW’s existing lineup to sell to the market. 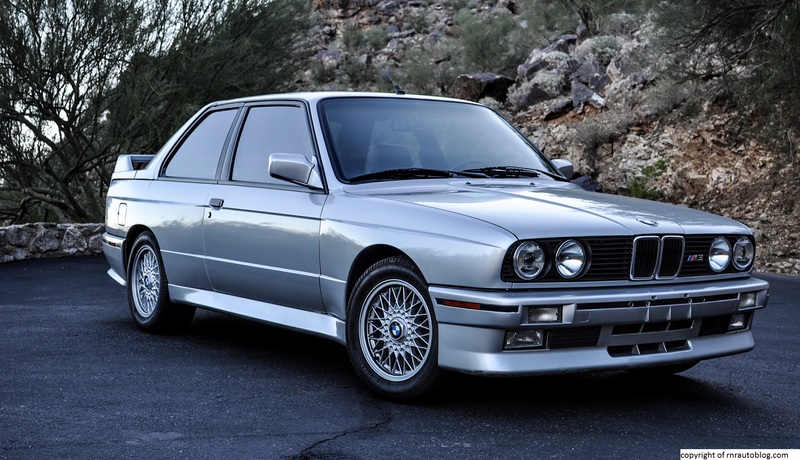 The first M-branded car launched was the 1979 M1, but BMW’s M division’s prominence did not emerge until they made an M version of the 5-series sedan, M535i, in 1979. 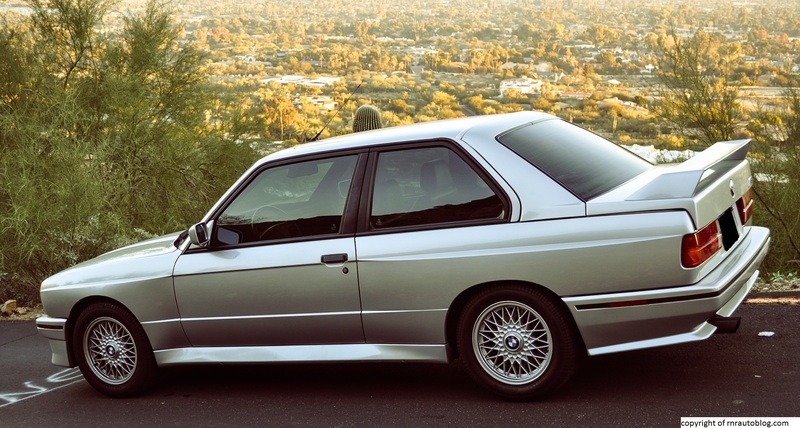 The first actual separate M model debuted in 1985 for the M5, a version of the 5-Series. A M version of the E30 3-Series followed (BMW vehicles are classified by chassis numbers, so this generation is the E30) in 1986. 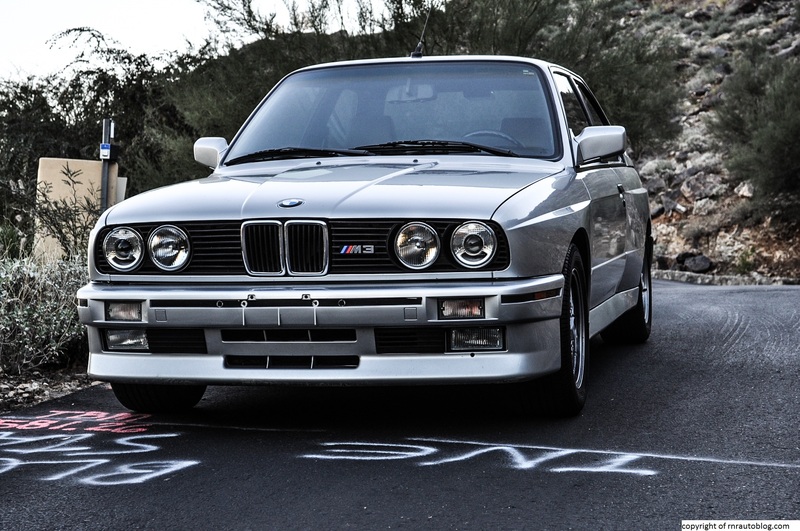 Initially, the M3 was built to fulfill motor racing requirements. 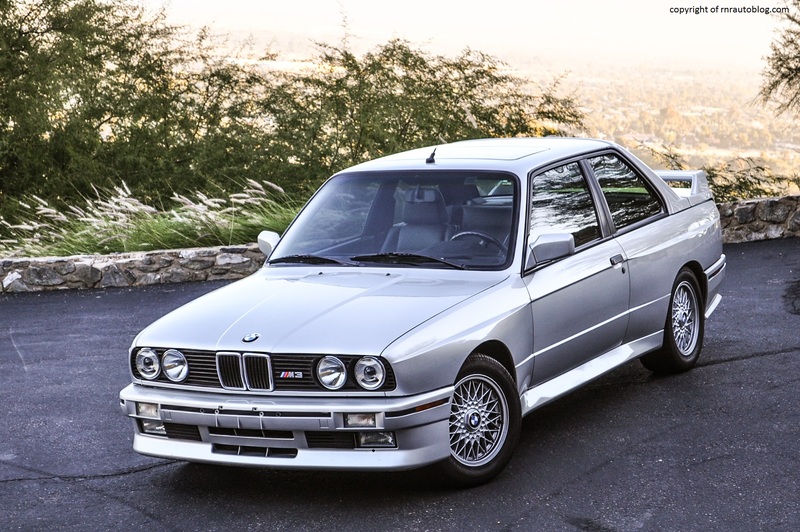 The World Touring Car Championship requires that the car be commercially produced in order for it to compete which is why the M3 was limited to just 5,000 units. 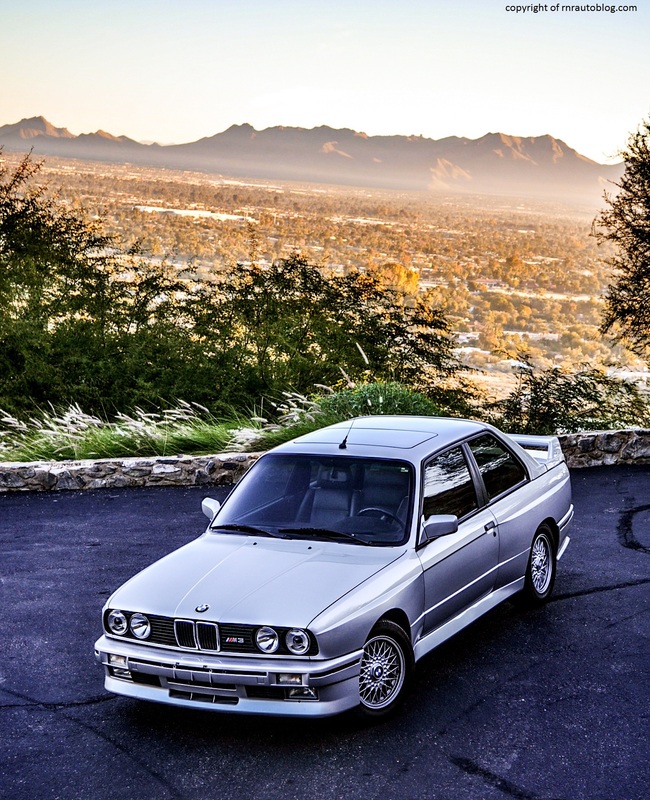 However, the M3’s success was unprecedented, so production was expanded to almost 18,000 worldwide (including both convertible and coupe models). 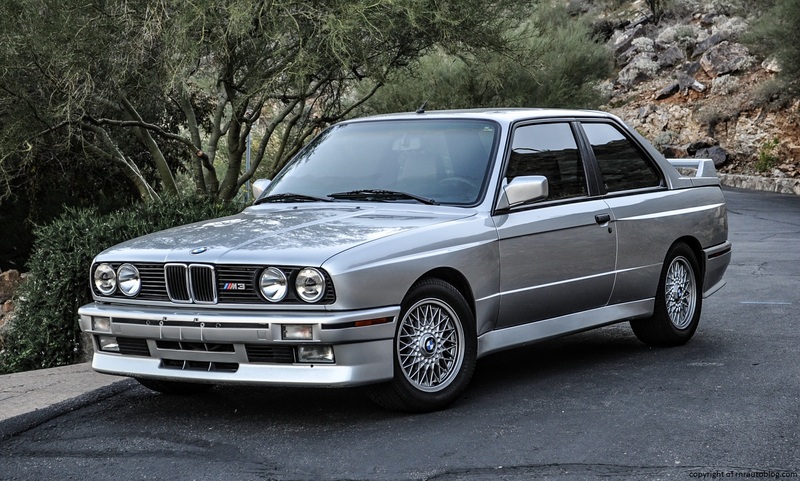 With the first M3 and M5, BMW and its M division cemented a reputation for itself in the automotive industry as a maker of the “ultimate driving machine” which was its slogan until recently. Sadly, as the luxury market has progressed in technology and power, BMW’s “M” cars have gotten a bit of an unflattering reputation. 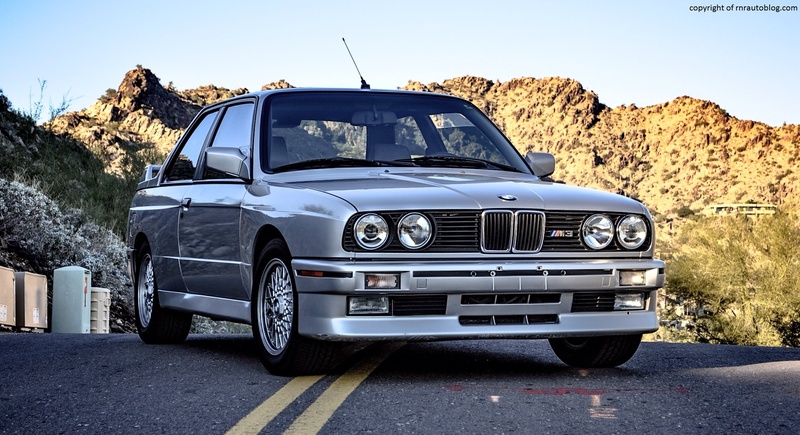 Once a division that pertained to strict principles of just manual transmissions, rear wheel drive, normally aspirated engines, the latest M cars are turbocharged, mostly automatics, and all wheel drive (at least for the SUVs and arriving soon for the M5). Not only that, and excuse my language, but the latest M cars have attracted a certain “douchebag” reputation. The general stereotype of the latest M cars is that they are driven by showoffs who could care less about the performance and handling capabilities and are focused on the cachet the M brand brings. However, this stereotype only pertains to the M cars manufactured around 5 years ago. This M3 reviewed here is the very first showcase of the M brand’s pure driving philosophy, and I was giddy with excitement as I got to review this gem. First of all, I have to say, I absolutely adore the styling. It is classic. It is simple. It is timeless. It is so late ’80s-’90s. Dare I say, it looks groovy (although groovy might be the wrong word to describes a ’90s car but oh well). 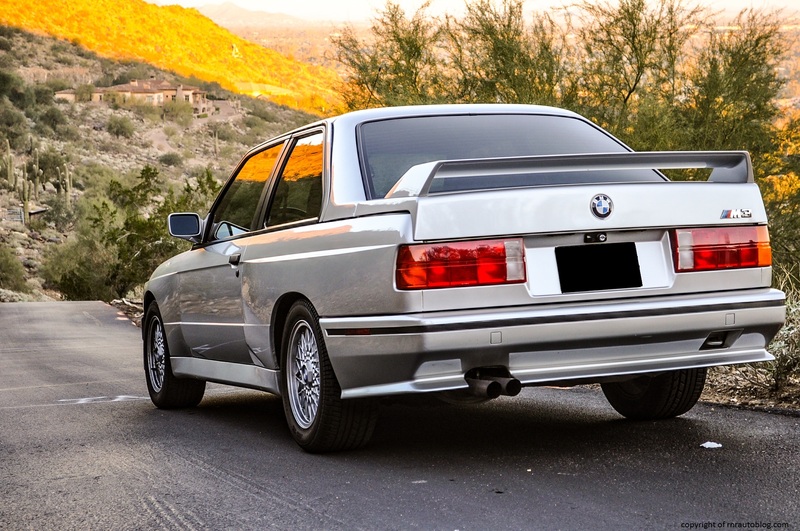 With slab sides and squared edges, the E30 M3 looks refreshingly analogue compared to the curvier and smoother modern BMWs. 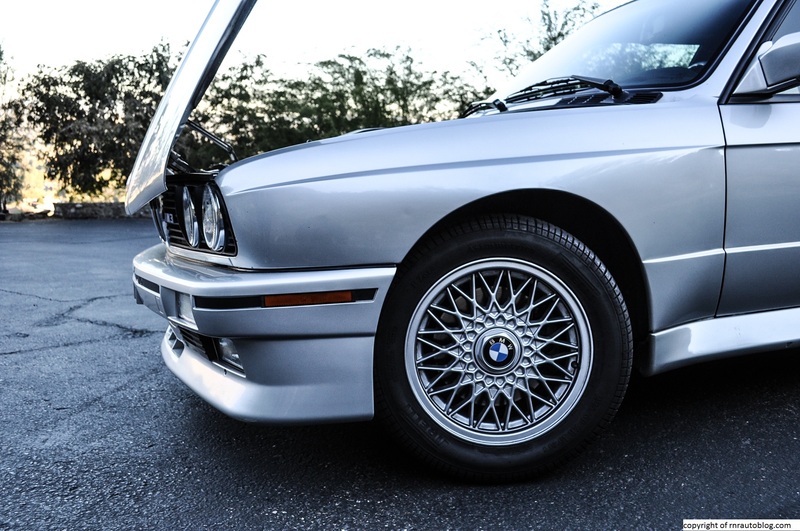 As always, BMW design characteristics remain, separated headlights (although on later BMW models, each headlight is now a single unit), the kidney grille, and the Hofmeister kink in the rear window. 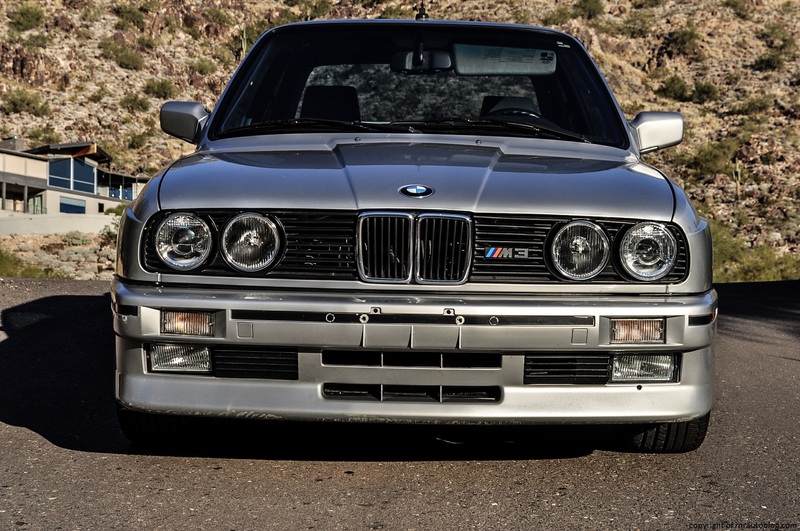 Just looking at the front, I declare that this is what a BMW should look like. It is uncluttered, elegant, and slightly aggressive. One nice detail is how the lines of the hood derive from the placement of the kidney grille. On the side, there is a distinctive line that runs from near the headlight to near the taillight, but aside from that it is pretty straightforward. 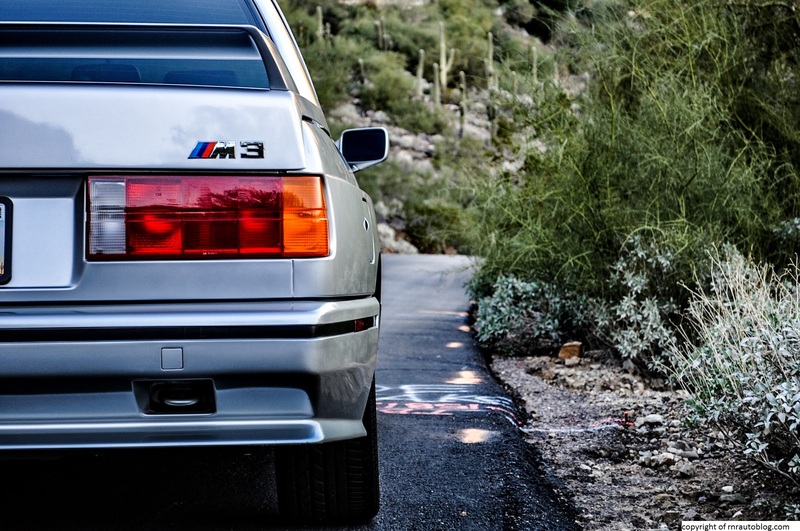 A M3-specific touch is the aggressive fenders. If you look at the front fender, you can see how it looks “fuller” or noticeably pronounced. 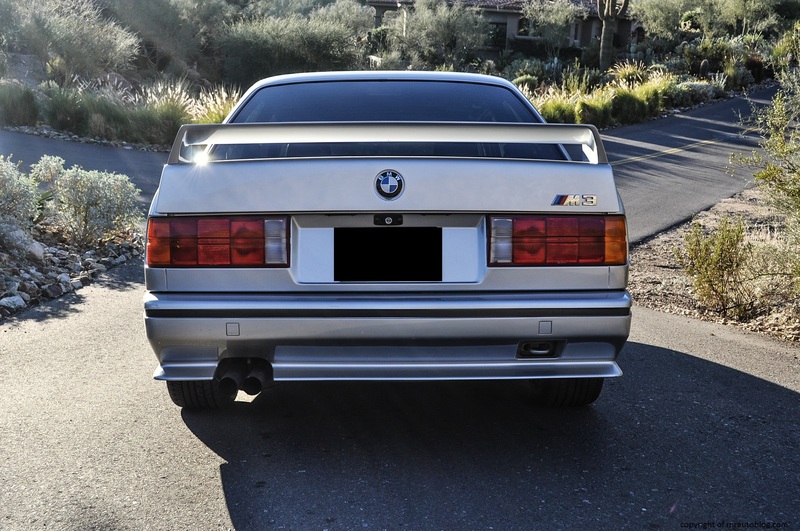 Remember when BMWs used to have square taillights? Ah, how I yearn for the old days. Just like the front, the rear is simplistic and clean. The only flaw I have with the exterior design is the trunk. If you look at the side of the car, you can see how the trunk appears to be grafted onto the body. Other than that, the design is pretty faultless. The interior is stark, but it suits the purpose of the M3. One of my favorite automotive publications, Car and Driver, made an article about 10 cars that you must drive before you die. 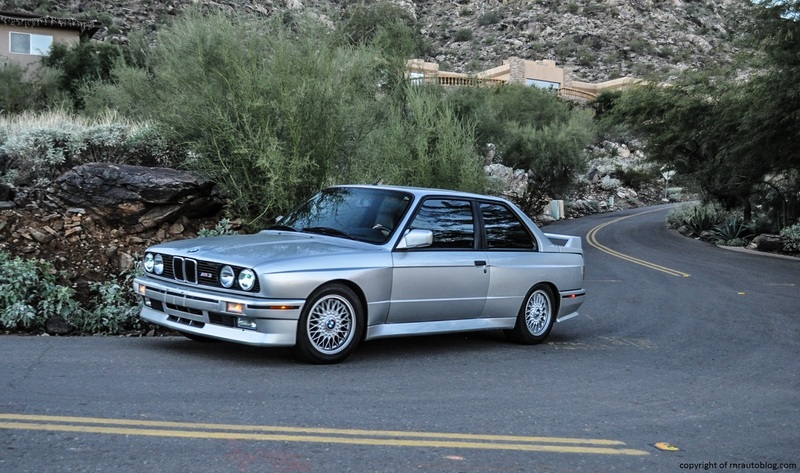 The E30 M3 is on the list, and a quick scan on Google search revealed numerous articles that commemorates this car. When I took the wheel, I understood what the fuss was all about. If I had to sum up the driving experience in one word, it would be extraordinary. Due to America’s stringent safety and emissions regulations, cars are burdened with the weight of required safety and emission technologies. This added weight has the effect of blunting handling and increasing weight compared with cars from 20 or even 10 years ago. This car, however, is not burdened with such things, and the result is marvelous. It feels unbelievably light at less than 3,000 lbs, and it darts like a house fly. The steering is probably one of the best I have experienced as the feedback is excellent, and I can actually feel the subtle change in textures and more. It does not even feel that like regular road feel as it feels like I am running my hand on the ground as I drive. It is that detailed, and the steering is lighter than I expected, but it feels substantial enough. It remains composed over mid corner road imperfections, and its fantastic agility allows it to carry high speed in corners. 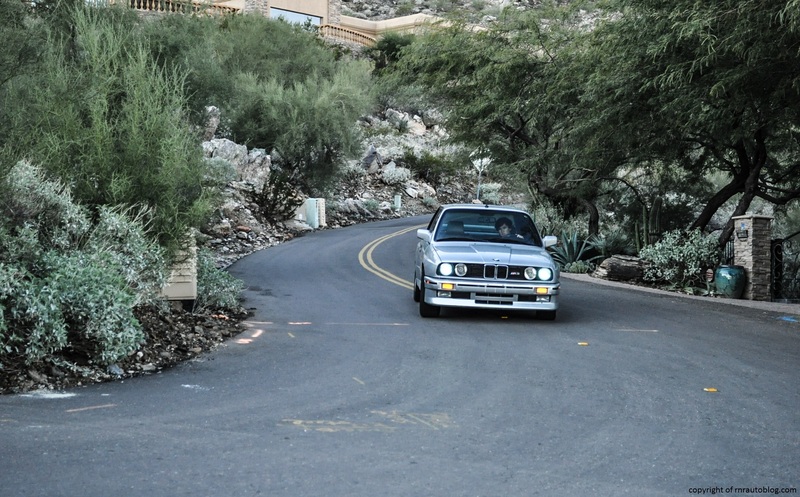 There is no trace of understeer, although it is very prone to oversteering; it is like a little puppy. Push it too hard, and it’ll wag its tail. It is a genuinely fun to drive car with a superbly balanced chassis and sublime steering. 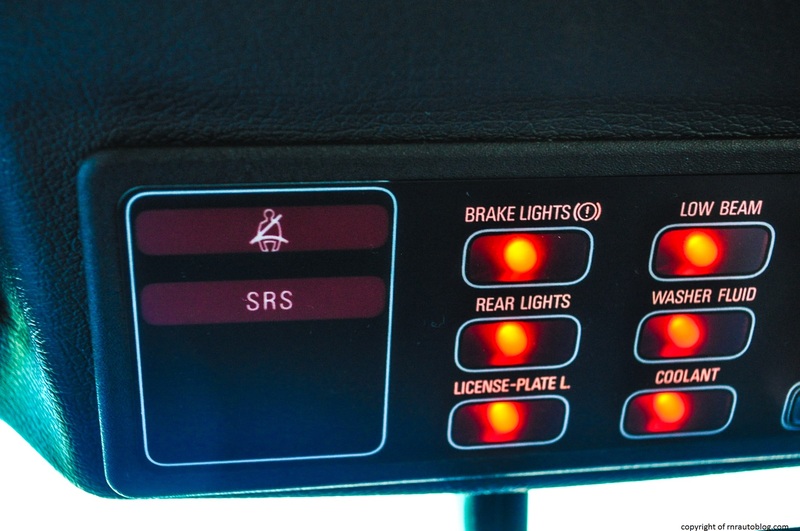 The brakes are excellent with firm and responsive brake pedal. In addition to providing a pure unfiltered driving experience, this M3 also provides the basic ingredients for such an experience. 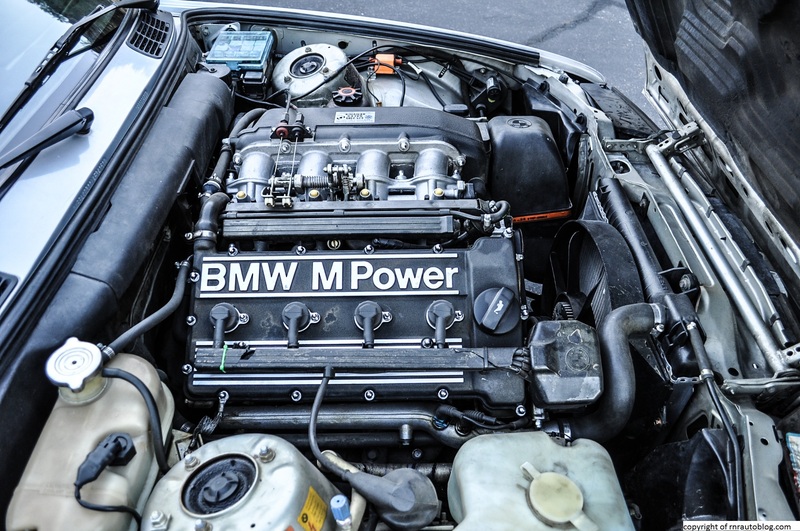 Even though inline six cylinder engines is a BMW hallmark, for this generation, a 190 horsepower 2.3 liter four cylinder engine was utilized mated to only a five speed manual transmission (remember the days when a BMW M car was only offered with a manual? Sigh). The four cylinder needs to be revved to deliver power, but the way I see it, that adds to the fun. At low revs, it lacks torque and feels flat. However, get it beyond 3,000 rpm, and there is a subtle pull, and once you hit 5,000, it really pulls towards its 7,000 rpm redline. 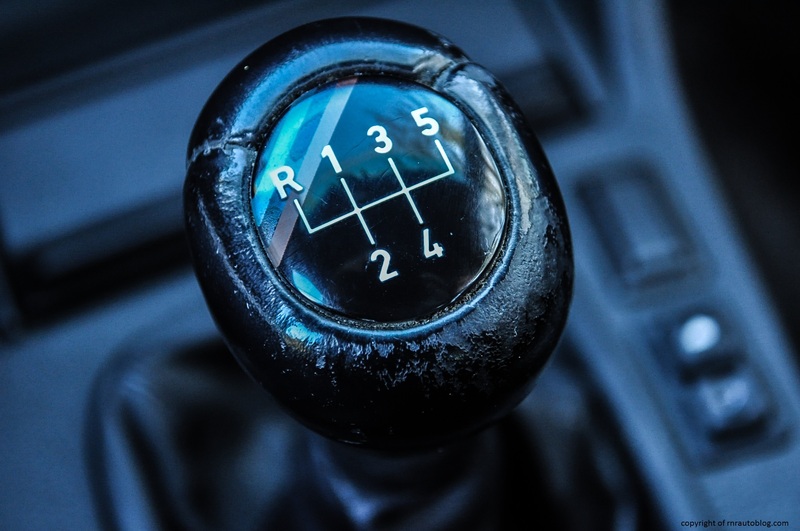 It performs just fine in everyday driving, but when you really need power, downshifting is necessary (assuming that you are cruising with revs below 3,000 rpm). In the power department, the four cylinder suits this car as it feels very peppy and strong, and acceleration is effortless. 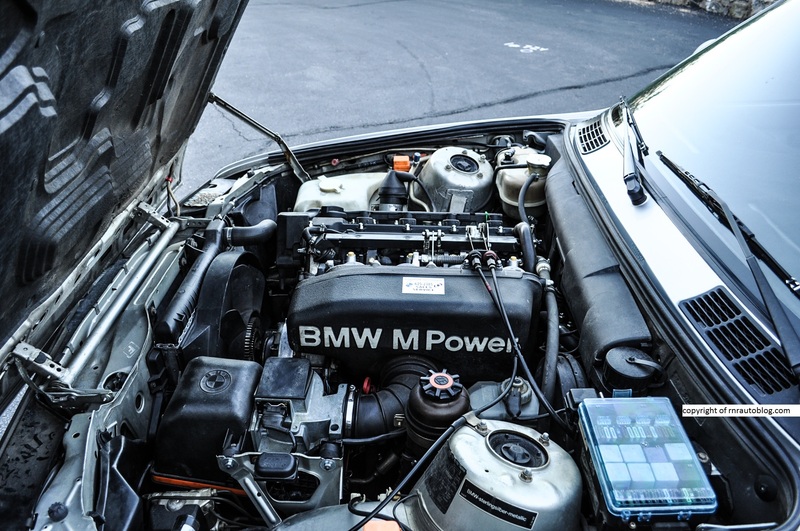 The five speed transmission has the BMW typical vices: it is a bit rubbery, and it isn’t the smoothest at times, but it has a nice heavy weight to it. The shifter’s quality does not bother me. The only thing that bothered me was that it vibrates noticeably, and the vibrating increases as revs go up. The clutch delivers excellent feedback, and its weighting is on par. 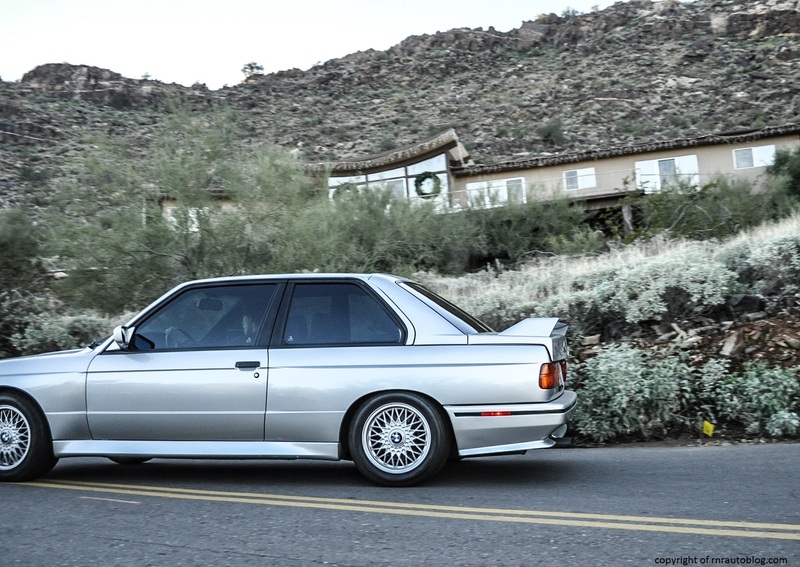 Interesting fact about this car is that in Europe, the M3 utilized a “dog-leg” gearbox (In this type of gearbox, the gearshift pattern is R, 1,2,3,4,5 so reverse would be where 1st would be). If you are one of those people who get annoyed at how noisy a car is, this car isn’t for you. While sonorous when revved, the four cylinder is thrashy at low revs. The tires may provides excellent grip, but they are audible on most surfaces, and road noise is present. 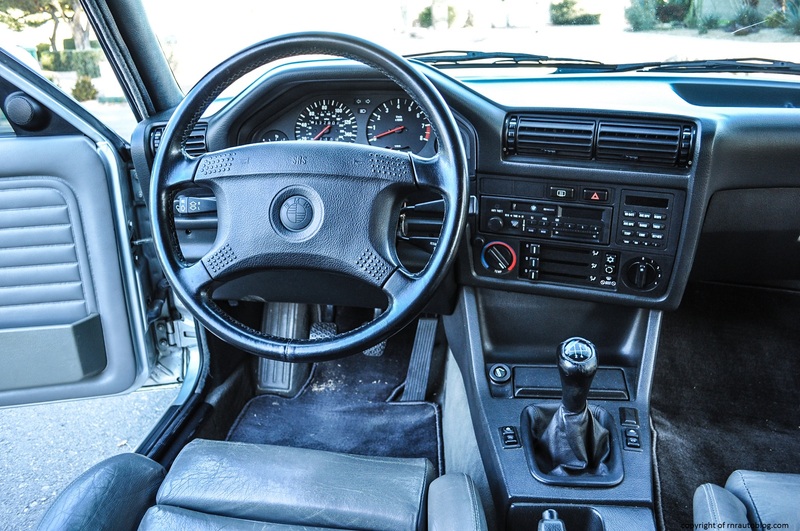 Despite its age, the interior is a far better place to sit in than many cars on sale today. The craftsmanship is excellent, and you can really sense the effort that went into building this car. Just like the driving experience, the interior does not feel manufactured…rather it feels like it was strewn together and handmade. The doors close with that Germanic thud, and the controls feel well lubricated. The driving position is perfect despite the non adjusting steering wheel, and the seating is just right; not too low to the ground but not too high off the ground. The upright cabin makes for excellent visibility, and the slim pillars enhance forward vision as well. The seats provide exceptional comfort with decent bolstering, and while the center console brushes against your leg, headroom is impeccable. The rear seat is surprisingly roomier than you would think, although I would not recommend tall adults back there. 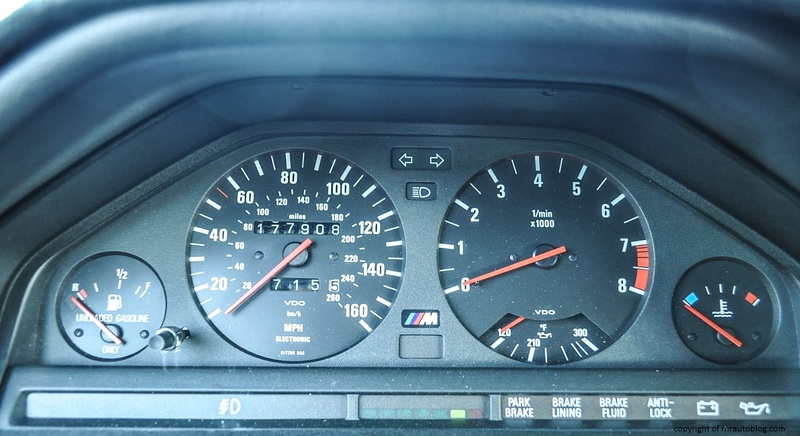 The gauges are paragon of simplicity. 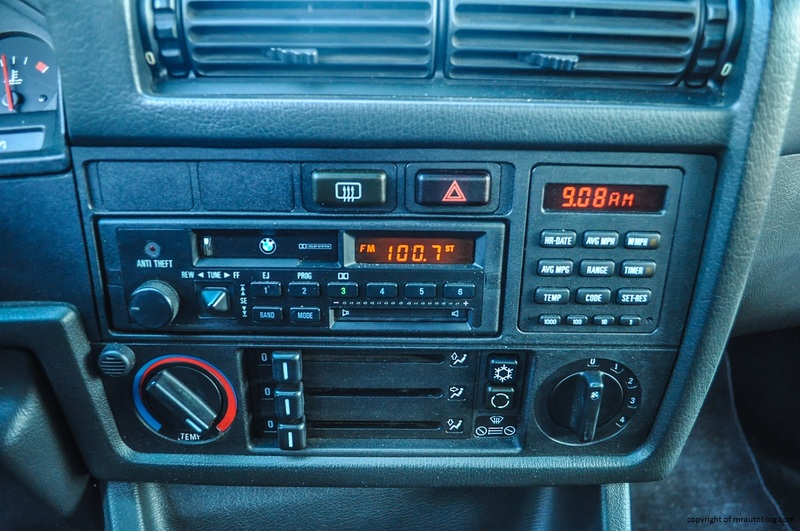 Why can’t cars nowadays have gauges that are as simple as these? The AC controls are intuitive enough, but the radio buttons could be larger and better labeled to aid ease of use. The trunk is on the small side, but getting in and out of the car is doable. Overhead by the windshield, there is this neat light board that indicates which lights are not working. From reading about this car, I knew that this car was coveted by the car enthusiasts crowd, and I was anxious to review one. As luck would turn out, I finally got to review a proper M sports car, and my, what a car! I can’t even describe the driving experience because I feel if I do, the M3 will come across as a car that handles well. It doesn’t just handle well, it is magnificent, superb, extraordinary, and any other adjectives you can think of. It literally feels like an extension of your body as it simply follows your inputs, and there is an indescribable blend of harmony and melody that follows as you drive. This isn’t a car that you can write about; it is a car that you have to feel in order to understand. It is that good. 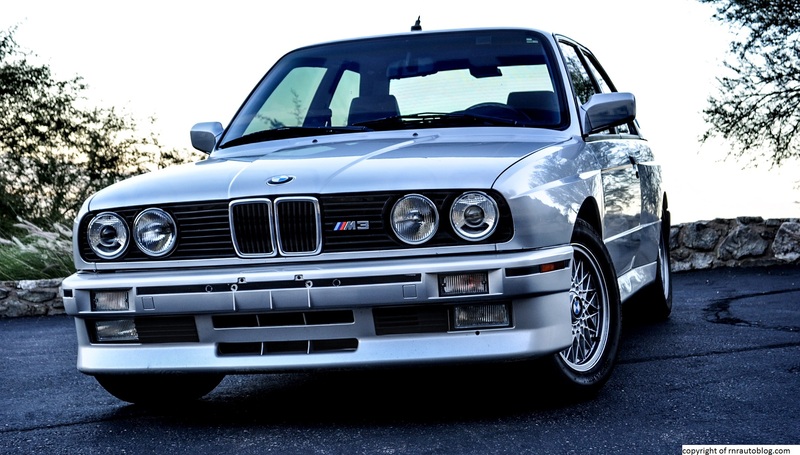 This was the first M3 ever made, and it set a tough standard for the following M3 generations. 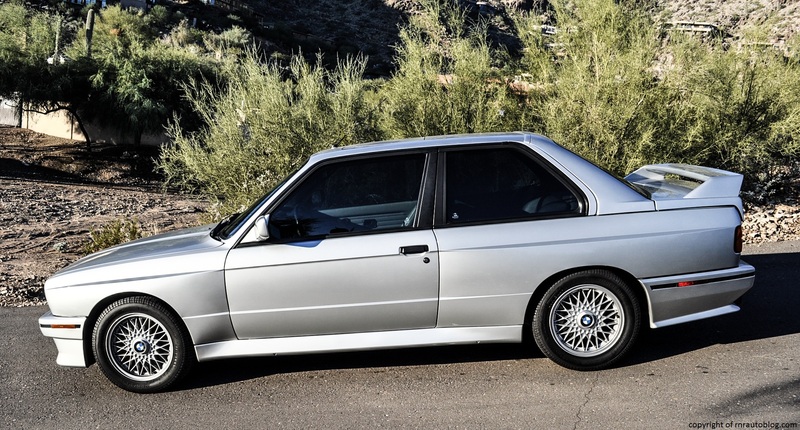 Word on the street is that this E30 M3 was the benchmark for the latest BMW 2 Series M235i version in terms of handling and driving enjoyment. 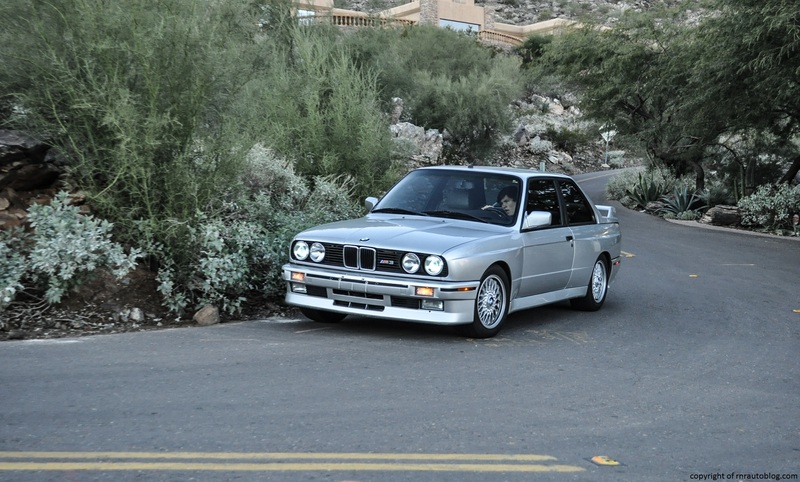 I realize that this is starting to come across as a love letter to the E30 M3, so I apologize. It is noisy, and the gearshifter vibrates annoyingly, and that is all I can find to critique this car. I have been pondering for a while, and I have deduced that in many ways, this car is perfection. 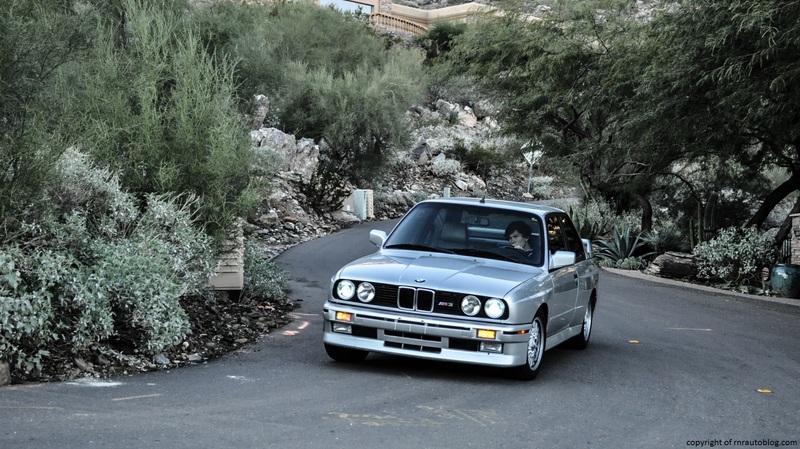 The E30 M3 is quite possibly the epitome of BMW. Nice write-up and excellent photography!